Chris James with his family. The family of a man who lost his last years to hepatitis C has welcomed a government inquiry into infected blood products. Christopher James from Oving died ten years ago. He had suffered a hepatitis-related bleed on the brain that left him unable to read, write or talk for the last five years of his life. Chris James before he fell ill. He had been one of a reported 3,891 people said to have been infected after being given imported Factor VIII, a form of blood coagulant, to treat haemophilia in the 1980s. His widow Marjorie, now 80, said she lost the love of her life and she hoped the inquiry this month would give the family much-needed answers. Chris was given Factor VIII for a knee injury and an extracted tooth in 1981 and 1984, neither of which she believed were justified uses. The contamination issue was first communicated in 1992. Chris James, who lived in Oving, became seriously ill with side-effects from hepititus C.
She said Chris became ‘seriously ill’ nine years before he died and praised staff at St Richard’s for their care when Chris was rushed to hospital bleeding from his mouth. Marjorie said the experience was ‘horrific’ and traumatic and her husband remained very ill until his death in 2008. 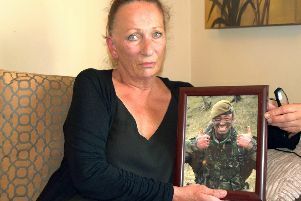 She gave up work to care for him but the family was told all documentation on Chris’ Factor VIII treatment had been destroyed. She said she was sad Chris’ grandchildren had never known him as the intelligent and loving man he was, who enjoyed sailing in his free time. The inquiry hearings start on September 24. Marjorie’s daughter is considering attending on behalf of the family.